Whether you provide the raw material, or would like Northlake to supply the complete product; we would be happy to handle your requirements. For immediate assistance, please feel free to use our Live Chat feature by clicking the blue chat bubble during business hours 8am - 5pm EST M-F.
Northlake can handle all of your bar & tube straightening needs with our eight roll straighteners (0 – #5) that can handle sizes up to 6” Rd and four hydraulic presses that can gag (press / bump) straighten sizes up to 16” Rd for bars and 19” OD for tubes. 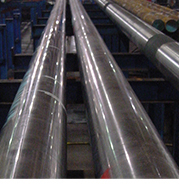 Our typical straightness tolerance is .001” – .002” per foot or .010” T.I.R. Northlake’s quality motto is “Quality – Start to Finish”. Keeping this in mind, we understand that the straighter a bar is going into a turner or grinder, the better the finished product. So, whether we are processing our material or converting your material, it all starts with straightness. 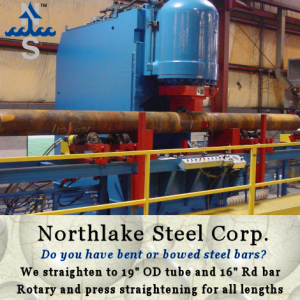 Click here to learn about the other steel services we provide. Northlake Steel © 2019. All Rights Reserved.